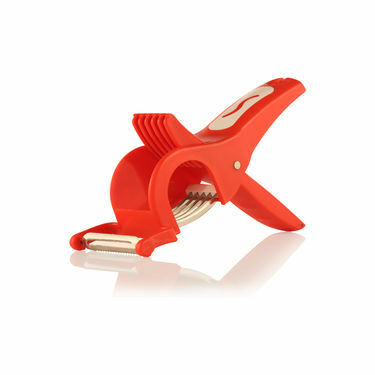 Enjoy the freshness of fruits and veggies with this Royal Chef Jumbo Juicer + Multi Cutter with Peeler - Buy 1 Get 1 Free, a great addition to your kitchen essentials. 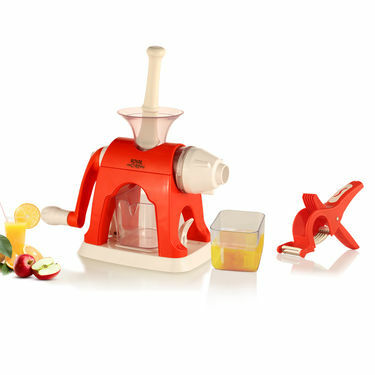 The juicer extracts every drop from fruits and vegetables. The sharp and high-quality stainless steel blades are rust-proof and stay sharp for a long time. Made from ABS Food Grade Quality, the combo is handy, easy to assemble, and comfortable to use and clean. 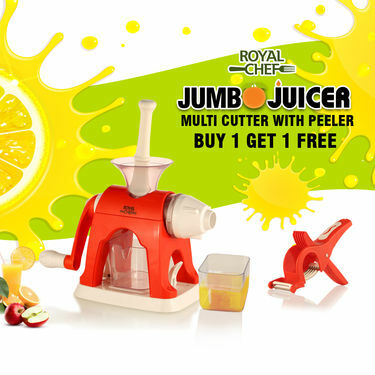 Royal Chef Jumbo Juicer + Multi C..VSRoyal Chef Juicer - Buy 1 Get 1 F.. Royal Chef Jumbo Juicer + Multi C.. VS Royal Chef Juicer - Buy 1 Get 1 F..
Royal Chef Jumbo Juicer + Multi C..VSRoyal Chef Smart Knife + Multi Cu.. Royal Chef Jumbo Juicer + Multi C.. VS Royal Chef Smart Knife + Multi Cu..
Royal Chef Jumbo Juicer + Multi C..VSRoyal Chef Puri Press + 21 Pcs Ki.. Royal Chef Jumbo Juicer + Multi C.. VS Royal Chef Puri Press + 21 Pcs Ki..
Royal Chef Jumbo Juicer + Multi C..VSKitchen Press + 8 Pcs Snacks & Sw.. Royal Chef Jumbo Juicer + Multi C.. VS Kitchen Press + 8 Pcs Snacks & Sw..